Ok as a recent D4 owner I need some 19 inch winter tyres. I looked at these in the summer and they were no cheaper and circa a 50% premium to those on our previous D3. Thoughts welcome ? 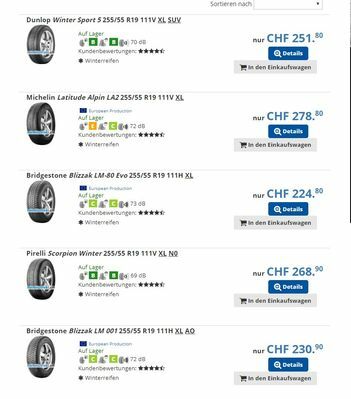 better to buy a set of 18 inch wheels and tyres ? Vredestein Wintracs, only way to go!! A few moths ago I’d agreed with you but no longer, been using Wintracs for eight years now, was ready to buy another set, but since a change in management and the new Wintrac Extreme S coming out they’ve become very expensive to what I’ve paid in the past. I’m due a new set soon. Will be interesting to see what AJS can do with the price. Thanks for that WW. Andy has supplied my tyres for years so I will be interested in his advice. It will be a shame if Wintracs have priced themselves out, have them on the Jag as well, performance is excellent compared to Scorpions which were lethal on that car. I use them all year so a change will be quite a consideration for me. PS: Don't know if you have ever watched Dean and Dave change tyres. It is a symphony in excellence!! Yes, they did two each in perfect harmony. Fitted four General Snowgrabber 2’s on advice from Andy, if they are good enough for Andy to use they can’t be bad.